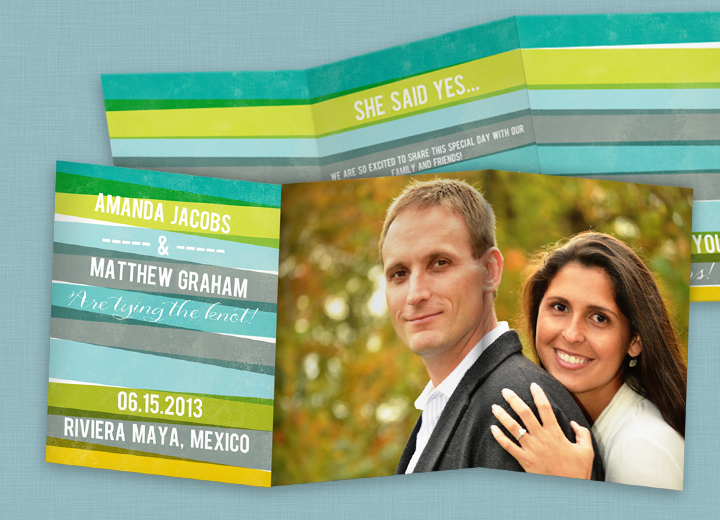 “When we finally decided to send out save the dates we were so discouraged! They all looked the same. The prevalent themes for destination wedding ideas are boarding passes, passports or palm trees. Also, it was very important to me to incorporate our engagement pictures because I was so proud of them. I really wanted something unique and festive. When I saw the Engaging Stripes in Blue – Save the Date Card on Pear Tree Greetings’ website, I knew immediately that I had found the right one! It had the look and the functionality we were looking for. We were able to add one of our favorite pictures and include all the important travel details. We received so many wonderful compliments, and we couldn’t be happier! !” We hope you have the wedding of your dreams, Amanda. And don’t forget your flip flops. Get started shopping for your own save the dates or if you’re looking for engagement photo ideas, be sure to check out our Pinterest board for inspiration! Keep reading our blog for more save the date ideas. Love the save the date!! Super nice! We agree, Sarah! Amanda and Matt did a great job with their card!